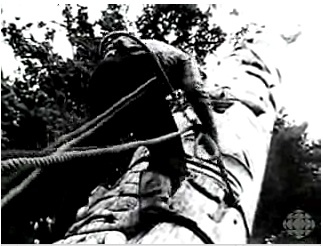 Roy Jones of Skidegate climbs a pole at SGang Gwaay. Source: CBC. Yesterday I noted the upcoming musical about the Bill Reid-Wilson Duff expedition to “rescue” carved poles at the Haida Village of SGang Gwaay (Ninstints). I’ve just found that the CBC has posted online a short documentary, (2013:edit, use this link) first broadcast in 1959 and narrated by Bill Reid, showing the removal of these poles to the Museum of Anthropology at UVIC. The expedition also included Wayne Suttles and Michael Kew, as well as Wilson Duff of course. The Haida crew consisted of Roy Jones, Clarence Jones and Frank Jones of Skidegate. Some aspects of the trip are recounted in the BC Provincial Museum Annual Report of 1957, which I will scan and post some other day. 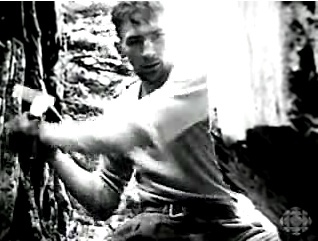 The spoken component of the documentary is a fascinating account by Reid, at that time just beginning his carving career, but the real jaw-dropping element is the depiction of the use of axes and saws and climbing spikes to log this forest of poles. Necessary, of course, but jarring nonetheless. A small boat ferrying Bill Reid and a team of anthropologists approaches the southern tip of the Queen Charlotte Islands. Reid documents the rescue mission to salvage and relocate the last of the crumbling Haida totems as revealed in this CBC documentary. With a sense of excited urgency, Reid describes and catalogues the enormous poles on the approaching shore. As they are gently felled, the majestic cultural landmarks will creak and groan before they are prepared for transport. It’s low resolution and grainy, but the general impression is a very powerful one. Felling a tree, surely, not a pole at SGang Gwaay. Source: CBC. This entry was posted in anthropology, Archaeology, archives, Cultural Resource Management, First Nations, Haida Gwaii, history, Northwest Coast and tagged Archaeology, archives, artifacts, Bill Reid, conservation, CRM, First Nations, Haida, Haida Gwaii, history, museums, Ninstints, Northwest Coast, SGang Gwaay, Wilson Duff. Bookmark the permalink.